Economic “his-story” à la Gil Scott-Heron | Growth is Madness! ← If I’m right, do I win a Nobel Prize? 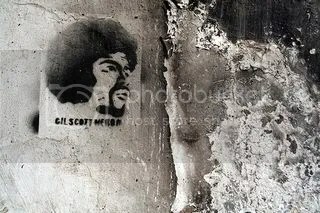 Gil Scott-Heron on GIM? It makes sense. I was watching a brief video of GSH addressing how black history was rewritten to suit the dominant white culture in North America, and it struck me that it made an equally cutting commentary on aspects of Western economic history. Of course, I also just thought it would be cool to get Gil on here. 🙂 He’s long been one of my favorite musicians, as much for his political commentary as for the excellence of his music. Along with long-time collaborator, Brian Jackson, GSH built a unique and significant body of work. He is sometimes called, the “Godfather of rap,” for long before the advent of rap/hip-hop, his “soul jazz” songs were often interspersed with spoken word, poetry-based pieces, invariably expressing intensely felt social messages. The most famous, of course, was The Revolution Will Not Be Televised. A question to consider is whether those behind our economic activity at some point repudiated their hegemonic ways. I think not. I think they make them a little less obvious today, and may not always be completely conscious of them. It’s not really so different, though, from the attitude of those who first imposed their economic aspirations in a blunt force manner on people in places like Africa. They rationalized their actions and insisted they were doing the right thing. Globally — and to profound degrees — the effects have been both socially unjust and environmentally destructive. The video also brings to the fore the element of greed which merits attention when examining the problem of economic growth. I hope, in fact, to take a serious look at greed in some future posts. Sadly, in recent years, Gil has fallen victim to drug use which has more or less ended his musical career — at least until he confronts his personal issues. More than that, he’s fallen victim to U.S. drug laws which make criminals of those possessing even small amounts of certain drugs. As a result he’s spent most of the last several years in prison. In my view, these unfortunate facts take nothing away from his music or his message of justice. For some pure GSH music, here’s a video currently posted on YouTube. It’s a live performance of his song, “Is that Jazz?” If you want to know more about GSH, here’s the best site. Its even includes a GSH discussion forum which has been active for a number of years. Enjoy. This entry was posted in Economic growth, Economics, Gil Scott-Heron, Globalization, Hegemony, Sustainability and the Big picture. Bookmark the permalink. Gil Scott-Heron is new to me, but the insane punishment mentality of the American penal system is not. Prison has become an industry with its own lobbyists and interstate “commerce” (California is shipping its excess prisoners to Arizona and Florida). Few states are taking any steps to reduce the trend of impirsoning more people. And of course putting someone in the harsh conditions of our prisons for years at a time makes them better people when they get out. The sad part is not that there is no evidence to support that conclusion, it’s that most people don’t care. We work from a strange ethical code thousands of years old — an eye for an eye — as if that improves society. Well said, Trinifar. I discovered Gil S-H in about ’77, in college. His sound was distinctive, as were his social messages. I would say he and Brian Jackson (who gets too little credit, but was a key part of the music for a long stretch) are up there with the top social commentators in music of the last quarter century. It’s interesting how the social and economic facets of history are so intertwined. Not surprising, really, but I guess I *was* surprised to realize that that video could be about one as almost as easily as the other. Did you ever discover Fela Anikulapo Kuti? Gil is a legend. How I wish I could witness a live performance. Hopefully he can rise above his current issues and record more! Fela Kuti is also a legend, and more people in the western world should know about him and his amazing musical legacy. “The Great Fela” – this was the way The Fugees introduced him to their audience, on the album “Blunted By Reality”. Fela was known as West Africa’s most important social critic – put in high regard amongst young people on the whole continent. His importance can’t possibly be overestimated. The man was simply unstoppable. Going in and out of prison for three decades, he would always, within the first week of his release, stage a new show – and always with new political dynamite lyrics: just produced in “The Inside World” (what he called life inside prison; a life that he considered to be much less crazy than the life he had to endure in “The Outside World”. Here’s a text which can tell us something about the situation we are facing today – in these times of ours, which should have been revolutionare, but, unfortunately, isn’t. Fela Baba can tell us why this is so. It has to do with people’s fear, really. Everybody run run run. Everybody scatter scatter. Some people lost some bread. Some one nearly die. Some one just die. Police dey come, Army dey come. Confusion everywhere. Seven minutes later. All done cool down, brother. Police don go away. Army don disappear. Dem leave Sorrow, Tears, and Blood (2x). Dem regular trade mark. *(CHORUS) DEM REGULAR TRADE MARK. Everybody run run run. Everybody scatter scatter. Some people lost some bread. Some one nearly die. Some one just die. Police dey come. Army dey come. Confusion everywhere. My people self dey fear too much. Dem fear for the thing we no see. Dem fear for the air around us. We fear to fight for freedom. We fear to fight for liberty. We fear to fight for justice. We fear to fight for happiness. We always get reason to fear. We no want die. We no want quench** **(destroy). Mama dey for house. Papa dey for house. I get one wife. I get one car. I get one house. I just build house. I wan enjoy. So policeman go slap your face. You no go talk. Our leaders dey yab for nothing. South Africa dey do dem own. Dem leave Sorrow, Tears, and Blood. I’m embarrassed to say I hadn’t heard of Fela Kuti. Reading your comment, googling around a bit, and listening to some samples, it seems he’s a major musical/social figure that slipped past my radar. Thanks for the intro. I’ll be checking him out. Hey, I’ve seen you’re sight before! 🙂 Though my French is limited, I can say for sure it’s one of the best Gil Scott-Heron sites out there! Thanks for creating it.